Signs of the Time? Say it Ain’t so Carrboro! Tonight I made the rounds of the major municipal precincts to pick up my Honest Abe “A house divided…” referendum signs. Beyond recovering those and some for various candidates, I also made numerous stops along the way to retrieve others. By the time I hit Carrboro’s Town Hall, I’d already visited 12 polling stations – covered 16 miles – almost filled the bed of my truck. Some signs were drooping from the rain, some had come loose from their staples, some were leaning precariously, some had blown off their stakes but NOT ONE – Republican or Democrat, popular or not – had been maliciously mangled. And then came Carrboro’s Town Hall. Carrboro, “always one degree cooler” as WCHL’s Ron Stutts says. Carrboro, the Paris of the Piedmont. Carrboro, advertised as a bastion of liberal idealism and progressive profoundity. Carrboro, the only precinct to get two of my homemade signs – placed prominently front-and-center. Carrboro, where the only signs mangled, torn and completely destroyed were mine. Did you stop to consider that placing a Republican icon (Abraham Lincoln) on your signs may have left some with the perception they were part of some vast, right-wing conspiracy to oppose District Representation? 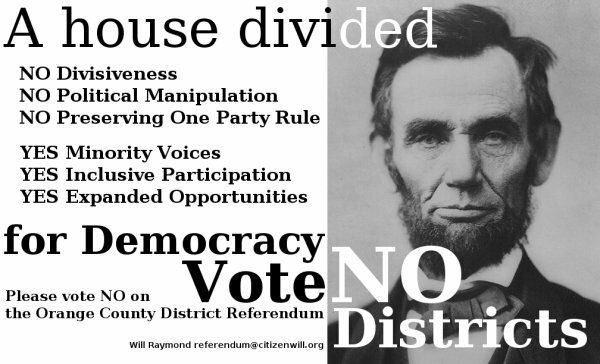 Without taking the time to read any of the smaller text, the most prominent features of the sign is Abe, Vote No Districts, A house divided, and for Democracy. The sign sorta looks like a Republican ploy to oppose District Representation. Now imagine how that perception might go over in Carrboro, of all places. Perhaps a photo of Gandhi or the WSM dancing man would have been more effective for the Carrboro precincts? Thanks Paul. While I knew Abe was a Republican with a tainted reputation in the old South, I didn’t think of the slant you put on it. Excellent analysis. Maybe that explains why Carrboro Town Hall was the only place my signs were savaged.